Stone by Stone mosaic stone tiles are the perfect marriage of history and art. The colors are all based on the subtle colors of ancient Greek and Roman mosaics. Each mosaic stone tile is approximately 3/8" (10 mm) square. The shape, height, and thickness of the stones varies, no two stones are alike. Stones cannot be broken by hand, but they can be cut with mosaic tile nippers without crumbling. With Stone by Stone mosaic kits, you can choose either a ready-to-make kit or loose stones. 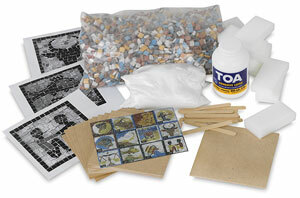 You can also choose from a wide variety of other Mosaic Starter Kits. Available in 1 kg (2.2 lb) or 5 kg (11 lb) assortments of 12 colors. The 1 kg stone assortment contains approximately 1200 stones, enough to cover about 1.3 square feet (about 1,250 sq cm) with a tight pattern. Children will enjoy learning about the signs of the zodiac while creating these beautiful mosaic plaques. This school pack contains 12 templates, 12 wood boards, colorful mosaic stones, glue, grout, sponges, mixing sticks, and detailed instructions.